So I want to save the world right. Turns out the world is a very complicated thing and, in order to have any hope of fixing its problems, one must understand many different fields at the one time. Due to the amount of time it takes to gain a good understanding of even a single field, it is difficult to have any amount of expertise in multiple fields, and individuals who possess this are rare indeed. I am currently in the early stages of trying to accomplish the feat of being a truly multidisciplinary problem solver. One of the fields in which I am most lacking in knowledge is in economics. It seems surprising that I have not turned my attention to economics earlier, as it combines mathematics with the study of human nature – and both are areas which interest me. Formally, my training in economics consists of one course which I took while I was studying at Columbia University. It was “The Economics of Uncertainty and Information”, was fascinating, and very advanced. I’m not sure how I was allowed to take the course, since I technically satisfied none of the prerequisites and, in practice, only satisfied the mathematics prerequisites. In any case, I missed out on all the introductory stuff, and have slowly filled in the gaps (some of them) just as a side-effect of studying lots of other stuff. Being able to approach this relatively young field with the perspective of someone who isn’t formally trained is a bit unusual, and probably an advantage. Most of the best-known economists started out in different fields, the most common being mathematics. So I certainly don’t feel that I’ve really missed anything by not having an undergraduate background in economics. In addition, I know plenty of people who do possess an undergraduate background in economics who are complete morons who are capable of getting good marks in courses, but not much else (this extends to majors other than economics, although it seems especially prevalent in this field). The purpose of this blog entry, I suppose, is to summarize the essential points to try and get things straight in my head. The history of economics is fascinating. The very early history is poorly studied, mostly because it generally lies in the realm of archaeologists who are seldom trained in economics, while economists often don’t understand anything about archaeology. This became most apparent when I read a paper by an economist writing about early agriculture who had made a dog’s breakfast of interpreting the archaeological record. It is also difficult because any hypothesis about cause and effect must necessarily be speculative as these things are very difficult to determine from the archaeological record. Much of what follows is my own opinion, although I am sure that I am not alone in holding these opinions. The development of economics is tied intricately with the development of human civilization. The process was not, as is often suggested, a very linear or predictable process. It was likely a very organic one. I tend to liken it to evolution – the same thing mostly keeps happening, and every now and then something different happens, and it either gives an advantage or not. If an advantage is to be had, then others adopt it or are defeated in some sense by those who do. All sorts of factors such as climate and physical geography determined which strategies did and didn’t work at different points in history. Detailed analysis of the aspects of physical geography pertaining to this can be found in Jared Diamond’s wonderful book “Guns, Germs, and Steel”. Indeed, many of my ideas regarding the early development of humankind are heavily influenced by this book. So, we start off pretty much on par with all the other animals. We walk around, hang out, and eat when we’re hungry. We spend a lot of time hunting and gathering food and, like other animals, we form small bands, mostly determined by blood-relatives. Tasks are divided up in some way for increased efficiency. And we have our first major economic step – division of labor. It’s not a huge step; many animals also do the same, but it’s a start. Language would have developed by this time, but not written language. Concepts like personal property are probably just starting to develop, and basic stone and bone tools probably came about around this time as well. These small bands would have probably been highly mobile, although seasonal settlements, during times when food was plentiful, would have been common. Survival at this stage is a non-trivial affair, and we shouldn’t forget that there still exist small bands of people today who live like this. What happens next? Probably a lot of things that failed. The next big step has to do with food production. We invent agriculture. It probably took a lot of tries, and I’ll bet it didn’t do much better than hunting or foraging for ages. Ultimately, it wins out, and here’s why: if you’re a band of hunter-gatherers you go out and hunt/gather your food. Let’s say you get very good at this, so you eat well and are able to support a larger population, and with more people, you can hunt/gather more. Of course, resources aren’t infinite, and eventually you reach a limit – there is a finite area that a large band of people can cover before it becomes too spread out. In the case of agriculture, intensifying food production leads to higher yields which leads to more people which will, in turn, lead to more food production. The key here, is that agriculture can sustain a much denser population than hunting-gathering can. There are huge advantages to having a lot of people in one place who don’t move much over a lot of people spread out over a very large area who move around a lot. Communication is key. I’m currently forming a new theory on economics in my head, and information, the amount that is shared, and its costs, is at the center of it. A densely populated sedentary group is guaranteed to do one thing better than the same group spread out over a larger area – innovate. Perhaps I should be clearer, when I say “spread out” I’m referring to distance measured by some metric of communication cost. These days, I can talk to a friend on the other side of the world for almost zero cost, whereas back then, a distance of more than a few hundred meters would have been an obstacle. Better communication allows for more efficient division of labor. A sedentary lifestyle also equates to a lower expenditure of energy (in general) so we end up with more food than we need, or the right amount of food, and some leftover people with nothing to do. This all leads to specialization, where labor is divided up and allocated according to a person’s specialization where the choice of specialization is either determined by preference, or (more likely) by some measure of talent. 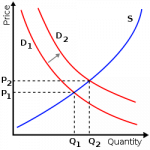 Which brings me nicely to my next point – comparative advantage. If Michael Phelps (the swimmer) and Gary Kasparov (the chess player) were to swap roles, we would end up with a mediocre swimmer and a mediocre chess player. I’m sure Phelps is a decent chess player, and I’m sure Kasparov isn’t bad at swimming either, but at the end of the day productivity is significantly lower for no other reason than because they swapped roles. Consider a slightly different situation, we start with two people who are equally talented at both swimming and chess. In one universe, they each spend the same amount of time every day doing each and, after some time and some improvement, the level of productivity levels off. In the other universe, one of them only swims and the other only plays chess. Because they are able to specialize, each of them ends up being much better at their respective tasks than they would otherwise have been, and we end up with higher productivity, seemingly for free. So what do we have? Increasing productivity is all about becoming more and more specialized and dividing labor more and more. The next question that I naturally ask is whether or not there is some kind of inherent limit to this process. Early on, this could have only happened within a small village where everybody knows everybody else. This way, you can divide labor and reasonably trust everyone to do their bit and everything works. Just think, in a village of 5, there would have to be 10 relationships, in a village of 50, 1225 relationships would have to be maintained, in a village of N people, there would be relationships (the handshake theorem). Obviously, early humans were able to overcome this obstacle. How did they do it? In a word, institutions. We tend to think of formal institutions like education and the legal system, but in this context an institution is basically “the rules of the game” which are followed to allow for complicated transactions to happen between strangers. Stratified structures of authority, such as an organized state is another example. Currency is another one that we don’t often think about. It is also ingenious in that it allows a large object of high value to be broken down into smaller bits. Curiously, currency is no longer tied to any fixed thing of value (previously, gold), but now is allowed to fluctuate in value according to supply and demand just like every other commodity. The cost of ensuring transactions that allow for more efficient division of labor would have surpassed the benefit of actually dividing that labor very early on but for institutions, which serve to lower transaction costs. What they really do is give each party a common ground, or “mutual information” on which to base their transaction, where otherwise establishing this would have been very costly. So human civilization is doing pretty well, then what happens? There’s a big flood, everything is wiped out, and everyone has to start over. Maybe there’s a drought, or a plague, or the climate does silly things. There are always risks involved with everything, things happen which are completely beyond our control. Let’s take a less dramatic example, you’re part of a small band of people living on an island in a fairly predictable, temperate climate, cultivating the land. You’ve divided the labor well and are living comfortably. There are two “food specialists” who take care of your agriculture, Bob and Marley. They each manage a plot of land on opposite sides of the island. Collectively, they both grow more than enough food to feed themselves, or their half of the band. One day, a freak tornado wipes out Bob’s crop. What happens next? The obvious thing to do, would be for Marley to just eat a little less and sell some of his crop to Bob. But what if this band hasn’t yet evolved any currency or, more likely, what if Bob hasn’t got anything to trade with Marley? If I asked a politically conservative friend, they would tell me that it’s Bob’s tough luck, and that he should’ve saved up for a rainy day. My response would be, “you’re an idiot” (I’m starting to see why I don’t have many conservative friends). The not-so-obvious, but correct thing to do would be for Marley to give some of his crop to Bob on the understanding that Bob would do the same in return. If a risk is shared among two agents, more risk can be borne than each individual agent can bear alone. This seems a very obvious statement. What is less obvious is how to pool risk. In examples like the one above, where there are a small number of agents, a contract is all that is required. When the number of agents becomes very large, mechanisms for risk sharing can become very complicated. Health insurance, and indeed all major forms of insurance are examples of large pools of people sharing risk. What is perhaps less obvious is the social welfare systems of many countries – taxes constitute a form of insurance premium and the dole can be seen as a form of “employment insurance” payout. Risk sharing also takes place on a very large (and very complicated) scale in securities markets. When the sharing becomes complicated, it is useful to actually understand the theory behind it lest we are plunged into another economic crisis like the current one which was triggered by the sub-prime housing bubble’s dramatic burst. A lack of regulation allowed a simple rule to be broken – that pooling risky assets decreases the risk if and only if the risk associated with each of the assets is linearly independent. So we divide labor and share risk. That’s basically what it all comes down to. If you think about the way those two things work, you’ll see that they’re intricately connected. Everything else is basically feeding into the labor-dividing, risk-sharing economic machine. There are other things which I have glossed over, or ignored entirely which are fairly important, such as the role of technology, personal property, market-equilibrium, and information, but these are all just grease in the machine (actually technology has a separate significance which I may cover in a later entry). Ultimately, it’s about growing more food. The advance of human civilization can be summarized mostly by who could grow the most food and who could focus the greatest amount of energy into the shortest amount of time (think about that one). What’s the problem then? There are still huge problems with human civilization, we keep killing each other for a start. Mentally disturbed people aside, the main reason this happens (and I’m sure many people disagree with me here) is because of scarcity of resources. People are hungry and poor, and when you have nothing to lose and everything to gain by killing someone, or collectively, going to war with other people, then the choice is obvious. Until very recently, I would have said that all this was inevitable, but in the last 50 years or so (some think sooner) the global GDP (the measure of productivity in an economy) has increased tenfold, and food production easily exceeds the requirements for the ever-increasing global population. The distribution of these now not-so-scarce resources is the real problem and one that economics should be able to solve. Unfortunately, resources are about to become scarce again as population pressures leading to climate change threaten to undermine food and energy productivity. That is my global view of the overall development of economics and how it basically functions. I would be glad to have any views on the subject from people who know better (and even those who don’t). As I said before, my understanding of economics comes from a very diverse and meandering experience which only ONCE specifically touched on actual formal training in the subject. Any and all feedback is welcome. An excellent point Stefan, and I feel quite the fool for having missed it entirely. Thank you for bringing it to my attention. It lives up to its title i.m.o. There are some minor points which I disagree (and in Rothbard’s other works, he does distort history to prove his point), but it is a wonderful work nonetheless. Very prescient. Politics and economics can be fundamentally reduced to the same issue i.e. what is the appropriate role of government? Different societies would require different answers, but economics and politics are intertwined. The classical liberals understood that there is also the greater issue of individual freedom and liberty at stake here – which led to their espousal of sound money and free markets. Ok, I spent some time reading both of those books and, while interesting, I don’t believe them to be good textbooks in economics. Or even good books in economics for that matter. Hazlitt’s book begins well to be sure, and is very well-written. In later chapters though, he betrays a very poor understanding of economics. To his credit, he does occasionally hit a good point and even does so with the accompanying correct reasoning sometimes. But all too often, he simply misses the point. Hazlitt also wrote a book which was a chapter-by-chapter critique of Keynes’ great work “The General Theory of Employment, Interest, and Money” which is mostly completely wrong (the critique, not Keynes’ work). Rothbard’s book was much worse, which surprised me because Rothbard studied under von Mises himself and had a strong mathematical background as well as a PhD from Columbia. It may be one of the most incorrect interpretations of the historical record that I have ever read, and the conclusions he draws from the lessons of history are quite baffling. It is difficult to describe just how bad I think this work is, and maybe I need to re-read it. You’re obviously a fan of the Austrian school (and I am obviously not one). While I could possibly agree with you that Politics can be boiled down to the question of the appropriate role of government, I cannot bring myself to say the same of economics. Economics is about the distribution of scarce resources. The two books you’ve linked are overly hung up on the concept of money and ignore the wider implications of monetary policy in the context of the larger economy. They also seem to carry an irrational fear of government interference in anything and a blind faith in the ability of free markets to solve everything, which is evidently absolutely not true. I suppose it is only fair at this point for me to recommend two books to you, although my two recommendations I probably not available for free online (I haven’t been able to find them, but that does not mean that they don’t exist). They are “The Worldly Philosophers” by Robert Heilbroner and “Conscience of a Liberal” by recent Nobel Laureate Paul Krugman. It would be good if you could elaborate on what you deem to be the deficiencies of both works. I.M.O. the main insight of the classical/Austrian economists is not that the free market is ‘perfect’ (there can be no ‘perfection’ so long as humans are involved), but most alternatives are usually much worse – because no one can have the necessary knowledge to intervene. I’ve actually read Keynes’ General Theory (as well as another earlier work of his, which was more in line with the classical school). It reads more like a rant by a ‘mad genius’ – and Keynes was indeed brilliant. In some other speeches of his, he points out that the problem with the Keynesian prescription is that it is heavily reliant on monetary inflation and debt, and the ‘levers’ used to ‘fine-tune’ the macro-economy are necessarily ‘blunt’ too. He also categorizes the post-WW2 countries into two groupings – the first one consisting of the Anglo-Saxon countries, who tried to stimulate economic growth via loose monetary policies; while the second group, which includes Germany, Switzerland and Japan, maintained (relatively) sound money – wealth creation were to come from hard work, skills, education (i.e. increases in productivity). I’m not an Austrian – just another guy interested in how the world works. But I was brought up to believe that savings is good, debt has to be paid, and that “the way to a better life was through hard work… education, skills, diligence”. So the classical insights are more in line with my instincts. I’ll check out the Heilbroner book – it looks interesting, thanks.